After years of experimentation, I have come up with the perfect recipe for easy, hearty, healthy, stick-to-the-ribs tasty chili, right in the slow cooker. And I’m going to share it with you. Dried beans, purchased in bags or in bulk, offer several environmental and health benefits over their canned counterparts. First of all, they have been processed less, therefore less energy and water have been used in their production. While metal cans can be recycled, there is still processing involved in either recycling them or making new ones, which is avoided when buying dry beans. Canned beans may also have BPA in the can liners, which is controversial and possibly dangerous, and there may be added salt. Cooking your own beans of course requires some advance planning. One great suggestion is to always cook more beans than you need, as much as your biggest pot can handle, and freeze the extra. Then you’ll always have some on hand, ready to go, when your recipe calls for them. When you do use canned beans, buy organic whenever possible and rinse very well before using. It’s that time of year when we’re setting out our seeds, whether you’re starting in indoor flats up north or already outside in the garden down south. Growing your own food saves transportation costs and associated pollution, and gives you ultimate control over pesticides, not to mention unbeatable freshness and flavour. You’ll get greater variety, since retail stores tend to focus only on the best-sellers. And it’s also a great way to teach your kids about living sustainably and green philosophies. Growing potatoes and onions is pretty commonplace, and even the most urban gardener can manage a pot of herbs. But have you tried growing your own chili peppers? If you grow paste tomatoes, ideal for hearty chilis, go beyond the basic Romas and try San Marzano, or heirloom varieties such as Amish Paste tomatoes. If you’re really adventurous, you might even try growing your own beans. I’m going to attempt kidney beans this summer, I’m curious to see if the yield is worth the space they’ll be taking away from my potatoes and tomatoes. After the harvest, can your extra tomatoes so that you don’t have to buy them in metal cans – for the same reasons mentioned above for beans. When you can’t grow it yourself, head to your local Farmer’s Market and buy it there. Many environmentalists believe that it’s actually better to buy non-organic food that’s locally grown, than organic food that has been shipped halfway around the world. Of course, local and organic is the best choice of all. Remember that carrots, bell peppers, and celery — all ingredients in the chili recipe below — are in the Dirty Dozen and should be your priorities for organic produce. 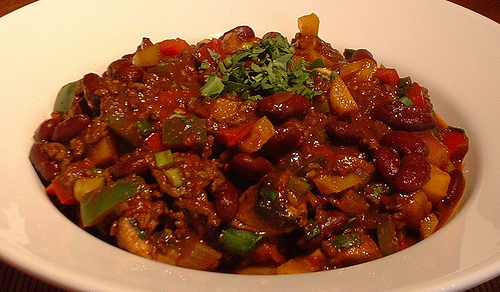 When most of us think of chili, we think of chili con carne — with lots of beef. If you’re concerned about the environmental impact of cattle farming, you can substitute bulgur (soaked in heated tomato juice) for texture, or just go without. With or without beef, add as many veggies to the mix as you can. You can put almost anything in a chili and it won’t overpower or “ruin” the flavour, so it’s a great way to “hide” unpopular but healthy veggies so that even your fussiest kids will eat it. Without further ado, here is my own chili recipe. This completely fills my 7-qt slow cooker, so if yours is smaller you might want to portion accordingly. The recipe does call for canned beans, because I know that most of us will use canned for at least some of the beans, and that’s how the recipe was originally developed. Just substitute an equal amount of fresh-cooked beans when you’re able to make that extra step. Mix it all up, set the cooker to high, and cook for about 6 hours until the potatoes are done and the chili is nice and thick. Serve with buttered texas toast, garlic bread, or nacho chips, and top with grated cheddar cheese. Store the leftovers — it’s even better the next day! This chili also freezes well, so put some up for the next cold, rainy day when you need some good comfort food. During my first pregnancy, I literally could not stomach animal protein. I don’t care for the texture of tofu, but I found that I could hide it in dishes like chili. After my oldest was born, I went back to eating meat in moderation but I’ve kept using tofu in my chili because it’s so much lower in calories than even extra-lean beef or chicken (94 per 4 oz. of tofu vs. 190 for extra-lean ground beef and 170 for ground chicken). Not to mention, tofu (or tempeh, or seitan, which would be my personal recommendation for this particular recipe) is WAY greener than beef!!! If you want your chili to be truly eco-friendly, ditch the meat.